My niece is getting married in November. My standard gift is money in these situations as I don't know peoples tastes. However she is she and her husband to be are very well off and to give them money would seem impersonal. I got to thinking and decided that I would run with what I had. 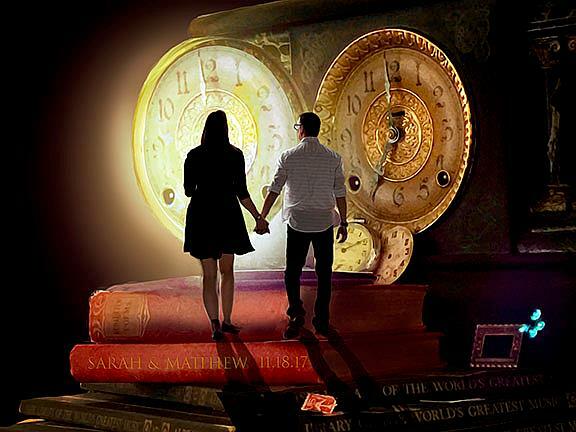 Here is what I know (as I have very little contact with her directly) They are obssessed with clocks, old books and keys. I looked at the on screen picture of them for the RSVP. Then I had this idea. I combined the photo of them with a still life I set up using old books and an art deco clock my dad gave me. I wrote thier names and wedding date as one of the titles on the books. It was compiled in CC 2018 and altered in onOne picture perfect. I am entitling it Synchronization.